In a 7-1 vote last week, the State of Hawaii Land Use Commission approved Castle & Cooke Homes Hawaii, Inc.’s proposed reclassification 767 acres of farmland to the urban district. Castle & Cooke proposes to build thousands of new homes and a medical complex at Koa Ridge between Mililiani and Waipio. The Sierra Club, Hawaii Chapter, as a party to the case, asked the Commission to deny the reclassification because the project would adversely impact an already congested highway and prime agricultural lands. The Sierra Club brought expert witnesses before the Commission earlier in the year that testified about the detrimental impacts of losing nearly 800 acres of some of the best farmland in the state. Even Castle & Cooke’s own expert noted that the Koa Ridge proposal would develop approximately 5% of O`ahu’s remaining prime farmland (soil rated “A” and “B” under the ALISH system). The State Department of Agriculture testified that fifty percent of O`ahu’s prime farmland had been paved over in the past fifty years. Other witnesses testified about the surplus of land already proposed for development in Central O`ahu and the negative impact of increased traffic on folks traveling along the H-1 corridor. The state’s traffic expert testified that the peak “rush hour” traffic could extend bottlenecks on the H-1 freeway potentially from as early as 5:00 am in the morning and similar hours in the evening. The H-1 already has a grade “F” designation, the worst service traffic level. The Sierra Club believes that the housing demand can be met without sprawling on more agricultural lands in Central O`ahu. Existing urban areas in Central O`ahu, such as Wahiawa and Waipahu, should be redeveloped. Further, over 13,000 units of housing have already been approved on over 1500 acres of agricultural land for new growth in Central O`ahu. Although the developer claims that new land must be developed to meet growing demand, population in some surrounding Central O`ahu communities actually decreased between 1990 and 2000. Got Input for the Army on its Environmental Investigations? Apply by August 14! U.S. Army Garrison-Hawaii is soliciting community interest in creating a Restoration Advisory Board as part of the Military Munitions Response Program for two sites near the U.S. Army’s Pohakuloa Training Area. The motivation for the Restoration Advisory Board is to enable community participation in environmental issues on previously used military training sites. Currently, the focus of the Restoration Advisory Board would be the remedial investigation of two response sites: the closed Humuula Sheep Station and the Kulani Boys’ Home. The Board will be formed if enough community interest is expressed. The Board would be composed of community members, government representatives, and other stakeholders. The Board members would attend meetings and review and comment on plans and reports related to the investigation. *Applications must be postmarked or emailed by August 14! We heart Kealoha Pisciotta and we’re excited to have her in town! We’ll be talking story and sharing `awa at StudioBe in Chinatown with Kealoha on July 25, 2008. She’ll be speaking and screening excerpts from Mauna Kea: Temple Under Siege, a film by Na Maka o ka `Aina. We’ll be talking with Kealoha about her experiences and activism in protecting of the sacred summit of Mauna Kea from development. Today, the IFA and a consortium of international institutions has a multi-million dollar proposal to build the largest telescope in the world on the last pristine plateau of Mauna Kea. A Hilo girl, cultural practitioner and former telescope tech, Kealoha’s tireless activism has helped to protect Mauna Kea’s sacred summit from unmitigated telescope development. She is the president of Mauna Kea Anaina Hou. 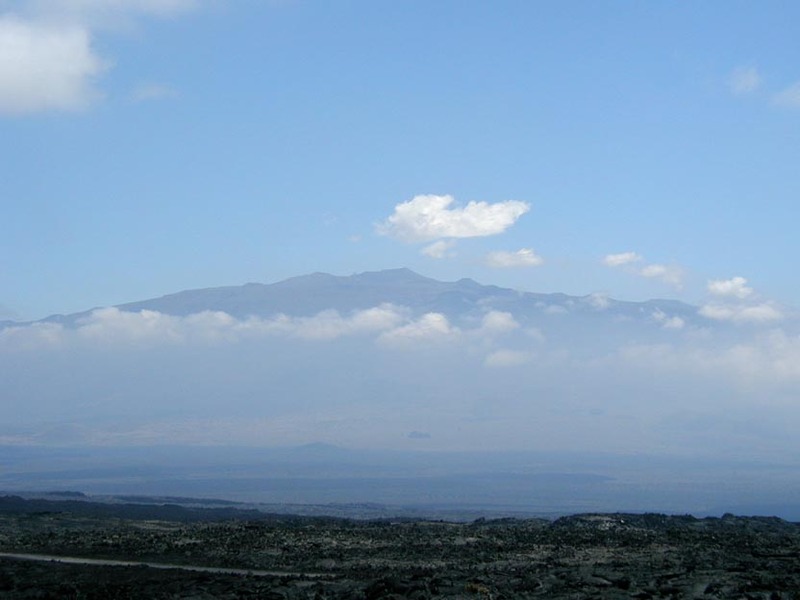 Mauna Kea, on the island of Hawai’i, is sacred as an elder ancestor and kinolau (physical embodiment) of spiritual deities. The summit area is also ecologically unique, and home the endemic weiku bug, which feeds on insects blown to the summit by updrafts. Today, thirteen telescopes and support facilities crowd the sacred landscape of Mauna Kea. Even after 30 years of community opposition, a consortium of institutions led by the UH Institute for Astronomy (IFA) continues to propose new telescope construction. Today, over 1,000 individuals regularly drive to telescopes on the summit, leaving behind some 500,000 gallons of human waste toxic chemicals such as ethylene glycol and liquid mercury over the Big Island’s only aquifer. 13 of the richest nations in the world currently pay only $1 per year for their use of the sacred summit. Construction has damaged and leveled the peaks, spewing dust and facilitating human intrusion that is wreaking havoc on this fragile and unique Hawaiian ecosystem. These impacts, coupled with the introduction of invasive predatory arthropods, are decimating populations of the wekiu bug, one of 11 endemic and imperiled species that call the mountain home. We are still sorting it all out over here. And while it is a shock, it is not really a surprise…Molokai Ranch’s true colors have finally been shown. They have played the “employee card”: they couldn’t shove their unwanted development down the throat of this community, so now they will take it out on their own workers, while blaming the development opposition for the “need” to do this. Indeed, the Ranch states in their press release: “Unacceptable delays caused by continued opposition to every aspect of the Master Plan means we are unable to fund continued normal company operations.” But this is so not true. 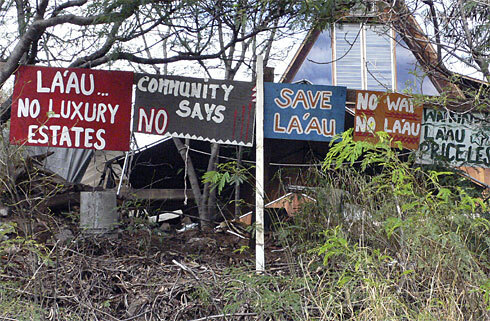 The community did not object to “every aspect” of the Plan; the community objected to the La‘au development aspect of the Plan. We have been consistent from the start in saying the there are many good parts of the Plan (and the community put a lot of work into creating those parts), but that developing La‘au is unacceptable to the large majority of this community. The sentiment in the community is that we feel deeply for the workers who have lost their jobs, and we will support them in whatever ways we can: by trying to find them new jobs, or by creating new jobs with better economic engines, and by helping to provide food during this time. Molokai takes care of her own. But also, we see this as a great opportunity to bring stewardship of this island back to the people of Molokai. We were already working on various solutions before this happened: from investors with more appropriate endeavors, to the UPC windfarm, to conservation buyers, to buying the Ranch, to a combination of all of the above. Now we are going to push to bring those kinds of things to pass if we can. It was a historic day yesterday, but now, with your help and continued support, we might truly be able to make history. This island has a chance to have economic, energy, and food independence – a truly sustainable and self-sufficient community. A hub of sustainable agriculture, environmental stewardship, Hawaiian culture and aloha. We can Ho’i i ka Pono! We can truly Keep Moloka’i, Moloka’i! 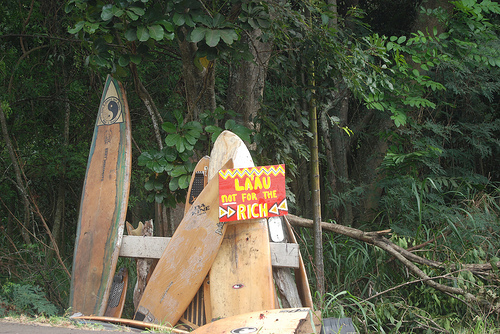 200 Luxury Estates a good thing for Molokai? 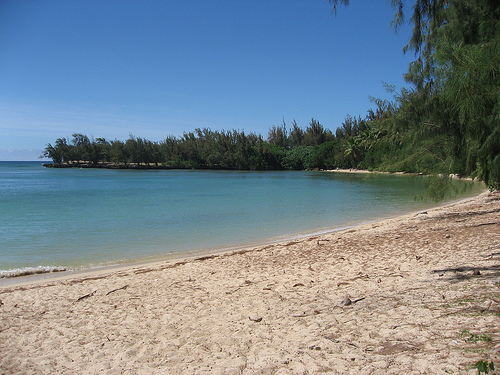 Last week, KAHEA submitted written testimony to the State Land Use Commission in opposition to “the proposal by Molokai Properties Limited to build 200 luxury estates at La’au Point” which will negatively impact the environment and culture. 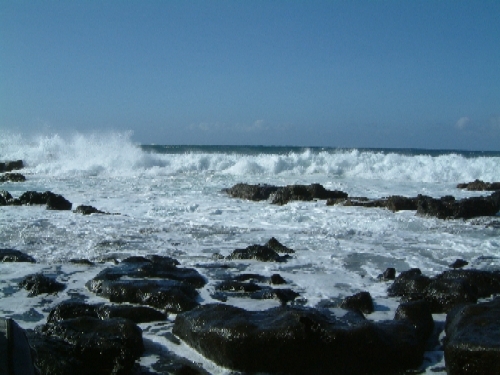 Our comments point out that: although there is overwhelming scientific evidence supporting that the main Hawaiian Islands serve as foraging and breeding grounds for monk seals and millions of dollars for research and monitoring have been set aside, little has been done by the state and federal governments to permanently protect habitat — like that La’au point. The truth is that the single most important action we can take to save monk seals is provide them places of permanent pu`uhonua, true and forever sanctuaries. Monk seals survive best when left alone in a place where humans do not dominate the landscape, in sanctuaries marked only by the presence of blowing sands and waves crashing against jagged lava formations at the water’s edge. Further, because “Molokai is one of a few communities that still have resources to sustain traditional subsistence”, they need to be honored and protected to ensure the perpetuation of these traditional practices of gathering for their families and communities. The reason why these practices still remain today have to do primarily with the fact this shoreline is undeveloped and difficult to access. The proposed development will limit access to this 5-mile stretch of coastline by providing only two points of entry, one at each end of the proposed coastline development even though the “state law requires that public access to the shoreline be available every quarter mile” which is clearly not honored in this proposal. The Molokai community has voiced their undying concern regarding the relentless and greedy development plans of Molokai Properties Limited. The community has no interest in having a community split and culturally and socially restricted by the influx of big money. Today, they are standing up, protecting their inherent rights to collect what they need from the mountains to the oceans that keeps their culture alive. To make this place no more than a picture postcard tropical beach destination is to strip it of its most fundamental and uniquely Hawaiian identity. We stand together with communities on Molokai to share the view that the sea, land, culture, and people remain vital in marking this land as a Hawaiian place.